Electronics was an interest and hobby of mine before it became a career. I still like to play with circuits and design electronic systems for use in my other hobbies. I find it relaxing to play around with electronics on evenings when the day job schedule involves mostly meeting and management tasks. Occasionally I will commercialize my designs and sell them on my other website for Unified Microsystems. My real love in electronics is embedded systems, where small microcontrollers interface to the outside world. Software on the microcontroller allows it to monitor inputs, make decisions, and control outputs. The same technology advancements that have brought down the cost and increased the power of PCs have also happened in the microcontroller world. Microcontrollers are under the covers just about everywhere. Your car probably has a dozen or more. Your microwave oven has one. I wouldn’t be surprised if your toaster has one. Even in small quantities, some microcontrollers cost under $1. I have designed microcontroller based systems based on about a dozen different microcontrollers over the years, including the 6800, Z80 and 8051. In recent years I have primarily used Microchip PIC® and Atmel AVR® processors. Microchip really changed the world in the early to mid 1990’s with their powerful and low cost microcontrollers combined with development systems even students and hobbyists could afford. I also like Atmel processors, especially the MegaAVR® family. The ARM® processors look very interesting for systems that require more processing power, and I have started working with them. ARM processors pack a lot of computing power at very low cost. So far I have been concentrating on the Atmel Cortex M0+ ATM processors. The higher end PICs and AVRs, and ARM chips have built in debugging emulators. Reasonably priced in-circuit debugging tools provide a development environment for under $100 that would have cost $10,000 not that many years ago. I program almost exclusively in C, with occasional assembly language efforts. I used assembly language for almost every microcontroller project from the late 1970’s through the mid-1990’s. C is just so much more efficient from a programming stand point. My other electronics development equipment includes a dual trace 100MHz Tektronix oscilloscope, Rigol DSA815-TG spectrum analyzer, frequency counters, various multi-meters and signal generators, an EPROM and PLD programmer, and of course an assortment of soldering stations and hand tools. I have a well stocked junk box of electronic components left over from other projects, removed from surplus circuit boards, or picked up cheaply from electronic flea markets. As time allows, this site will be used to document projects I have done that others might find useful or educational. Hopefully you will find something of interest here. If you are a student, hobbyist or engineer learning to work with microcontrollers, you might find the series on microcontroller interfacing useful. 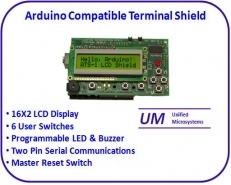 Unified Microsystems a source for electronic equipment, modules and kits for engineers, electronic hobbyists and Amateur Radio operators. A series on how to interface external electronics to microcontrollers.